Angry parents storm head teacher’s office over poor results. Photo by Judith Amusugut. Parents and political leaders in Manafwa district yesterday (Monday) stormed the office of the Bubulo Secondary School head teacher, Thomas Wamundu, demanding to know why the school performed poorly in the recently released Uganda Certificate of Education (UCE) examinations. The infuriated parents have further threatened to withdraw all their children from the school if Mr Wamundu and his deputy are not transferred. Bubulo SS had no student in first grade while only 13 students obtained second grade out of a total of 160 students who sat the 2017 UCE examinations. The irritated parents and political leaders tasked the head teacher to explain the mediocre performance of the school that a few years ago was among the best not only in Manafwa but in the region. “We want value for money. We do not want to spend our hard-earned money and our children fail to pass,” one of the parents who preferred anonymity said. The parents claim that the dwindling performance started when Wamundu was posted to the school. They also accuse him of corruption and embezzling school funds, something they say has resulted in poor performance. Mr Thomas Wamundu in his office. Parents are blaming him for the declining performance. Photo by Judith Amusugut. But in an interview with PML Daily, Wamundu blamed his teachers for the poor performance. He accused them of absenteeism and negative attitude towards work. John Musila, the LC5 Chairperson, however, asked the head teacher to present to them the accountability of the USE funds availed to him. 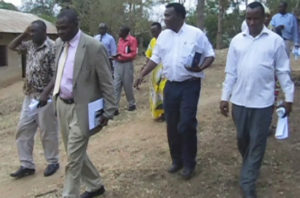 Rose Mutonyi, the Bubulo West MP, said the only solution is to transfer the head teacher and it will be done as soon as possible and requested him to leave the school immediately.